In this series, I will be posting a weekly video on my YouTube channel that you can follow along at home. It’s free to subscribe to the channel so you can keep updated with the painting progress. A jam jar for cleaning brush. Painting was seen as a craft, you had an apprenticeship or trained in an Atelier workshop. Colour choice was limited, the vivid bright colours that are found in acrylics today just weren’t available and pigment choice paid an integral part in the painting process. Not just aesthetically but as a sign of power. Often, the bluer the painting, the richer the patron. The pigment Ultramarine blue famously used to be more expensive than gold. It was extracted from lapis lazuli, a semi-precious stone, that was used as the raw ingredient until the colourmaker Jean-Baptiste Guimet created a synthetic alternative to lapis lazuli in France in 1828. This is why it is often referred to now as French ultramarine. These days choosing paints to start with can be a tough choice. There are literally thousands of choices of different colours. Paint manufacturers have the urge to constantly produce a new variety or shade of pigment. To tell you that this is the ‘magic bullet’ the wonder colour that will solve all your painting problems. However, when we combine the principles from classical painting with the new modern materials of acrylic painting to create a method of painting that is both simple for the beginner to create pleasing results and broad enough for more practised artists to continue their study. Step 1. Apply a coloured ground. Step 2. Draw out the image. Using a 3B pencil sketch out the image to work from. Don’t worry if it isn’t completely accurate it is just a guide to get you started. Step 3. Establish the darkest darks and lightest lights. Using Burnt Umber & Titanium White establish the darkest area of the picture. You can squint your eyes at the image to help to distinguish each area rather than getting hung up on the details. This video below shows the first steps I take to start the acrylic landscape painting. Make sure to subscribe to my YouTube Art school Channel to keep updated. 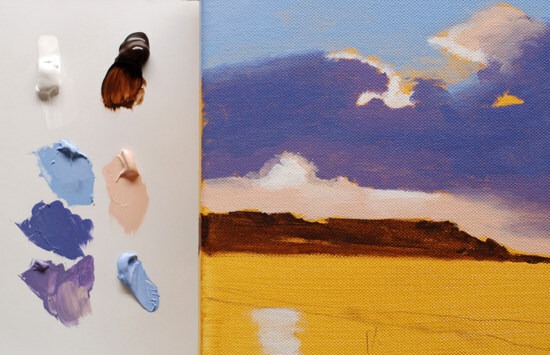 Morning class, I’m Will Kemp from Will Kemp Art School and this is part one in a free series showing you how to get started in acrylic landscape painting. We’re going to start with this image, you can download it straight from my website and I’m going to show you how to make this. How to get this painting from the photograph so you can do it yourself at home. On the website, I’ve got a list of all the colours you need, the brushes that I use, but this video is just how to get started, get your drawing laid out so can create a lovely landscape like this to have on your wall at home. 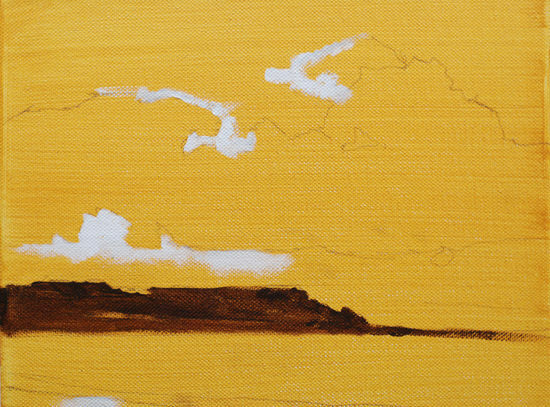 So step one in starting this landscape painting is to block out your canvas, to put a coloured ground onto it so that you can work your paintings on top. I’ve already done that here and you can watch a how to do it video on my how to apply a coloured ground for acrylic painting video. Okay, the second step is to draw out the basic shapes that we’ve got here. We’re just after the line drawing. I’m using a 3B pencil here which can be easily erased, it won’t smudge too much yet it’s dark enough to make a mark. See how it fairly easily it makes a mark on the canvas without feeling that you have to really press into it and dent the canvas. So a quick tip to make sure you get a nice horizontal line is just to use a piece of scrap paper and you line up this edge to the edge of your canvas so it’s like a set square really. So there, line that up. Step three is to assess the tones in the picture to see where to start and where are the lightest and dark areas. So the first thing to do is to squint your eyes at this picture. Half close them just so everything slightly blurs a bit. What you’ll find this does is it makes the dark look darker, the lights look lighter and all these what are called halftones kinda of disappear and what you really get to is the basic structure of the picture and that’s what we are interested in. So for this, the darkest area is this area here of the land so that’s what I’m going to paint in to start with the burnt umber. All the information on the brushes that I use and how to chose a brush for acrylic painting is on my other video or a list of other materials is on my website. So if you notice how when I’m painting I’m resting onto the canvas which helps you give leverage and support so you can, with the finer lines, erm it’s a lot easier to get a straighter line than if you’re hovering your hand in the air trying to balance it. So once I’ve got that in I’m now going to swap to this brush to block in that area. The paint that I’ve got on here because acrylics dry so quickly, you want to make sure you get that off otherwise it will go solid on your brush and you won’t be able to use it. So I’ll dip it into some water and then, you know, rub it into the kitchen roll. You get through loads of kitchen role with acrylic, and then just squeeze it at the end and you see how if I put that on there, nothing comes out. You know it’s completely clear, that’s just with plain water. It’s always better to have more water and change it regularly than use the same pot, it will get mucky and then what will happen that all that dirt in your water pot will come into your colours when your mixing and you won’t get a nice clean colour. Even though we’re using brown it’s still worth it to keep it clean, it’s good professional working habits. Okay, so now with the filbert brush. Okay as simple as that. I often paint around the edge for my paintings so I’ll paint around here. You’ll notice how I haven’t been too heavy handed, you can still see some of this underground glowing through and that’s really nice and I’ve left little bits where I’ve not been completely solid because I want a bit of texture, a bit of movement in this area. So that’s all I do for this particular painting with the burnt umber now I’ll put in some of the highest highlights in the brightest area which is going to be when we look at the picture. It’s going to be this area here where the sun is shining through. For this, I’m just going to use titanium white. So now with the titanium white, I’m just going to block in the very brightest areas. You see how I’m keeping it quite loose and quite watery. You’ll notice if you’re not using an artist quality titanium white it won’t be as thick as this it will be a lot more translucent. You might have to use a couple of layers. When you’re first starting with acrylics I always recommend buying the best quality paints you can afford. 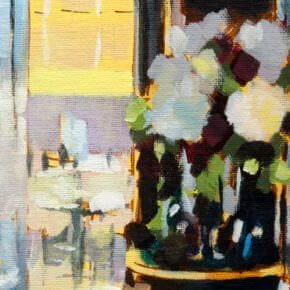 If you can’t afford to go artist quality for everything, definitely try and invest in an artist quality white because it’ll have so much more opacity it’ll be able to, see how it covered over the colour underneath really easily, this will be really beneficial in your future paintings. There’s a slight bit of lightness down here but not as strong as the others so I’ll just dilute it with a bit of water and just scrub it in with my finger. So now we’ve got the lights and the darks, now we can back to the colours that we were mixing before to start blocking in some of the areas of colour. The video below shows how I premix and match a few key base colours to build the painting. 3. How your hairdresser can teach you to mix colour. I am so happy to stumble across your site. I am determined to learn proper techniques in painting. I went to college and came away with a degree in Nursing- a decision made more for others than myself, but my heart always longed for the fine arts department. . .
Glad it’s time to unleash your creative side! and put yourself first. Really pleased you’ve stumbled across the site, looking forward helping you get started. Hey Will, I am a watercolor artist and just a couple weeks ago decided to play around with acrylics. I’ve searched the web and just couldn’t find any good information about beginning in acrylic painting so I ordered a couple of oil painting videos. BUT I stumbled onto your website and youtube videos today – I watched EVERY video and now am beginning the process of going through your blog. I can’t tell you how helpful your videos were – seriously helpful! Your color mixing videos helped me understand that the same mixes I use in watercolor I can use with acrylics – I wasn’t sure this was going to be the case but it really helps to know this. Any ways, just wanted to jot you a note to say thanks! Hey Sandi, Glad to hear you stumbled across my videos, and you’ve found them helpful. That’s a lot of colour mixing to watch in one session! Thanks for the dedication. Will, I also meant to tell you that I REALLY like your work – great stuff! I do have a question for you and you may have already addressed it somewhere on your blog – if so, tell me where and I’ll read up on it there. I just purchased some Open Thinner (because I’m using Golden Open acrylics and some Liquitex Basics paint) and was wondering how you recommended using it. I like thick paint for nice texture on the canvas so I didn’t buy it for thinning but to help the paint stay wet even longer and for blending. Would you recommend me add it to my water, directly to the paint, or spray my paint that’s on the palette with it? If you are painting quite thickly the OPEN acrylics will stay wet for days without any medium added. Of course, the more of the normal acrylics you add (Liquitex Basics), the quicker the drying time. So I can see why you wanted to try and ‘balance out’ the drying time by adding the OPEN thinner, however, I wouldn’t necessarily recommend using the open thinner mixed with thick paint. Anything over 3-5mm in thickness and I would avoid using it. What I would recommend using is a gel because it will help to keep the thickness of the paint and slightly increase drying time. You could add a touch of retarder to it (not more than 15%) to help out with the drying time. The main benefits of the OPEN thinner are to be able to thin out acrylics for more watercolour type techniques that still have a longer working time, The thinner can also be added to the Liquidex Basics ( I would mix it in directly with the paint) and will act the same as a slow drying medium (acrylic retarder) just have a thinner consistency. So really, thinner is designed for thinner use of paints, gels are designed for thicker use. 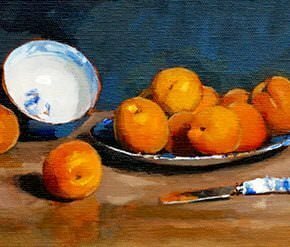 p.s I’ve just had an email to say you’ve signed up for my ‘Art of acrylics’ Still life painting course which is brilliant to have you on board! you can post comments or questions on that site, at each stage of the painting and I’ll reply directly to you. I also show you what mediums I use, so that might interest you with your paintings. lets get painting! Thanks very much, pleased to hear you’re enjoying it. I am so happy to come across your website yesterday and since then I am watching all your acrylic painting videos. You are an amazing painter and teacher. I can really follow your instructions very easily. I am currently taking an acrylic beginners art class and I am totally lost and cannot follow the instructor. I am determined to learn proper techniques in painting with following your website. Please let me know on the proper start for an acrylic painting for a beginner like me who has no clue on painting or mixing colors. I always prefer to work on a coloured ground as it becomes easier to judge tones and establish the darkest darks and lightest lights to your painting. You are a remarkable mentor in that you speak in layman’s terms in a manner of face-to-face communication, pausing in some spots to make a second attempt, so that few can fail to understand. So many know their craft totally,(some profs I had in college) but were purely inadequate at conveying that knowledge to anyone but a fellow academician. Kudos to you my man! NB: My dad was from Cornwall, my grandad a member of the Royal Academy.Cornwall..what a classic place to paint….cottages,fishing villages, et al. Sounds like you’ve got some great painting heritage! 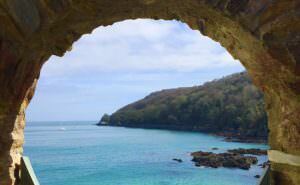 Cornwall is so beautiful, a real inspiration. Really pleased the videos communicate the techniques clearly, I do believe that keeping it simple provides the greatest progress in the shortest amount of time. Paypal make it look like you have to have a paypal account in order to pay but you can pay with a regular credit/ debit card – they just make this option very subtle with small lettering. Click this link to watch my how to pay with a debit card video without a paypal account. The answer is Yes in about 1 weeks time! I am going to offer this course as a download which might be of interest to you? Let me know if I can help more and if you want to wait for the download option I can keep you in the loop when it’s ready to go. hav seen ur painting style ,, its amazing.. wel i need lot of tips from u .. would like to start from easy paintings…. i actually dont know wht kind of painting sheets to be used… to get a perfect paintings…. Hi Will, thank you for this..I painted this landscape using soft pastels. You have a great website. I don’t feel intimidated by the content, but encouraged. You’re welcome Fulya, encouraged but not intimidated is perfect to hear! I’ve been stalking your website, watching all the videos, reading the pages. I’ve never taken art classes, just what you get in high school, but have always liked drawing and painting. I’ve always wished I had time to take proper art classes, but there’s no physical way that will happen, so I am trying to learn what I can online. Anyway, last night I tried my hand at this one. How frustrating that my talent does not equal what my mind’s eye thinks I should be able to do. Last night I was convinced it was complete crap and in no way looked like anything. This morning I am happier. My toddler seems to think it looks ok…”Sunset. River…s’not a river…biiiig lake.” (We’re in the midwest US, no oceans here.) Fresh eyes today and fresh perspective, and I’m ready to forgive myself and am geared to make further attempts. A quick run to the art store for a couple tubes of better paint and I’m off to try another one. Thanks so much for your message, so pleased you are finding time for your paintng. I’ve had a quick look at your painting and the colours are looking great. I think the better quality paints you’ve invested in will pay dividends to get nice solid blocks of colour in your work. Watch out for the horizon line, make sure it’s crisp. And the best thing to hear is you are enjoying yourself! With the help of some excellent books from Betty Edwards and Bert Dodson, I’ve been learning to draw over the last year or so. I was planning to try colored pencils next, but my mother let me play with her oils awhile back and gave me a set of acrylics for Christmas. I’ve been reading your site and watching your videos for the last couple days and you’ve given me the courage to jump in. Thanks!!! I just completed the steps in this video and so far so good. My first attempt at creating the yellow ochre background turned out much too dark. I didn’t have the fluid acrylic and didn’t use enough water when thinning out my paint. The second go turned out great. I also started out with the filbert brush and then realized you were using the round one. Not sure that it matters much, but if/when it does you might want to point out to us “absolute beginners” what you’re holding. I am getting so much from just watching you work! The instruction given is impeccable and there’s definitely something for every single beginner here. However, I have a question (I hope I’m not repeating someone else’s question– point me in the right direction if that’s the case.) I found your guide on color mixing very helpful, but I’m wondering where to go from there. I never seem to have enough of JUST the right color. Once I get the right mix, am I just supposed to repeat the ratio of colors in a larger amount for more to work with on the canvas? I noticed in “Acrylic landscape for beginners, part 2” you had samples of what was created in your color mixing video, but in a much larger quantity. Hi Kate, thanks for dropping by, pleased to hear you’re finding the videos helpful. This means when you are painting you can easily pick some more of that ‘perfect mix’. You don’t need to do this for ever colour, just a few key colours throughout the piece. So it might take a bit longer to mix the colours but your actual painting time will be much quicker. It is often handy for more neutral softer colours as to achieve a bright vivid colour is very easy straight from the tube. Please look at your books and see if I owe you something. Hey Rod, nice to hear from you, pleased to hear you’re feeling better. Composition can tricky sometimes, one of the simplest things to do is vary the shapes and spaces between objects and never keep any two things the same. It’s amazing how effective this can be in creating a composition with interest. Are you unwittingly committing a compositional cardinal sin? I don’t see where I can download the sky scene picture from the Absolute Beginner Part 1. For the landscape image, if you go to the reference photo, just above the materials list on Absolute Beginner Part 1, it can be ‘right clicked’ and ‘Save image as’, so you can use it as a reference, print it out and follow along with the video. It did help. Thank you Will for getting back to me so quick. I was able to save it. You’re welcome Jeff, pleased you’ve got it downloaded. I was wondering if you had any videos that would help me understand how to do an Impressionist still life painting? I saw that you had a landscape and seascape video option, but are there any ways of incorporating impressionist techniques into a simple still life? wow this is great instruction for a beginner like me, I was just about to go out and pick up my first set of acrylics and i really feel like i have an idea of how to manipulate them now. I will def be coming back for more instruction! Thanks! Hey Laney, you’re welcome, pleased to hear you’re enjoying the videos. You might also like this article on how to choose a basic palette, or this one on choosing a starter set depending on your end colour style you’re after. Sure thing Minimew, just crop a bit of the sky and beach so your reference image is in proportio and you’re good to go. Several questions, Do you recommend doing the mixing on the stay wet palette or a hard one and then transfer to the stay wet. I’ve just started with acrylics and SWP’s and my paint seems to water down and when I apply the paint to canvas it is very thin and the background bleeds through. I paint along with the video and by the time I apply the clouds and try to blend into the sky, the sky has dried, how do I keep the paints wet long enough. Are you using an extender or open paints? Lastly, is there a place in a painting that you wouldn’t want to stop and continue later. Do you recommend doing the mixing on the stay wet palette or a hard one and then transfer to the stay wet? It’s always easier to mix on a hard palette and then transfer to the stay-wet palette if your mixing large amounts of paint, as the membrane on the palette is easier to tear if you’re mixing the paint piles with a palette knife. If you’re mixing smaller quantities of paint with the brush then you can do it all in the stay-wet palette. I’ve just started with acrylics and SWP’s and my paint seems to water down and when I apply the paint to canvas it is very thin and the background bleeds through. Because of the nature of a stay-wet palette the water is always slowly seeping through into the paints so will water them down slightly. If you are using student quality paints they will be thinner in consistency so will water down quicker than the artist quality heavy body paints I demonstrate with. 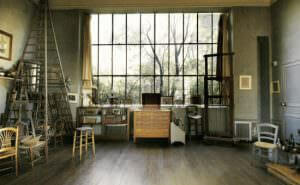 Here’s an article about the differences between student grade and artist quality paint. How do I keep the paints wet long enough. Are you using an extender or open paints? I’m not using an extender or open paints in the demo, as you’re coming from oils the difference in drying times will be quite noticeable. You can extend the drying times slightly with mediums, but not a great deal. When I’m blending skies or the foreground. Thanks for the very quick response. It makes a little more sense now. Will be signing up for some of your online course early summer. Need to get the hang of acrylics first. hey, its awsum…i hv a question..can i used this method with oil painting colours…?? 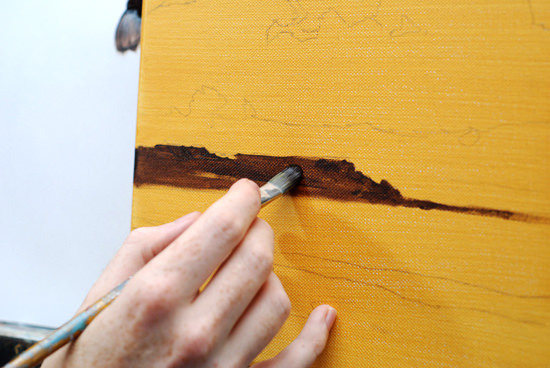 If you have the ground colour with Acrylics, then you can use Oils on top and it will work really well. What would I need to buy to start landscape painting? Im kind of confused like where would I get a canvas and that yellow paper you were drawing on? and what is a 3b pencil? Hi Jason, all the materials for this painting are at the start of the article. 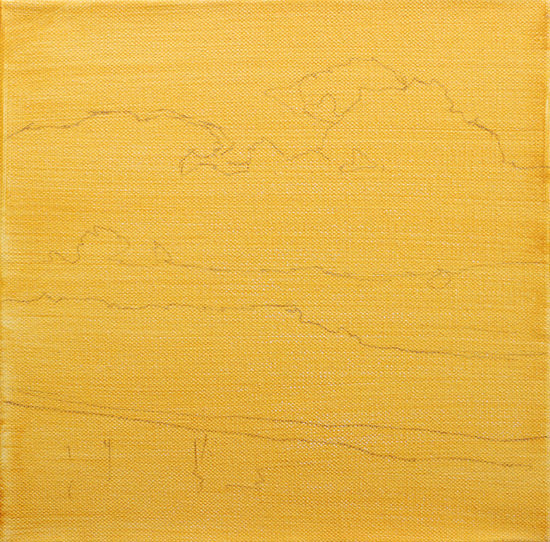 The yellow paper, is yellow ochre paint that has been applied to create a coloured ground onto the canvas. rtist pencils are labelled with a “H” (for hardness) to “B” (for blackness) so a 3B is a medium softness, 9B is the softest pencil. Hardest to softest: 9H, 8H, 7H, 6H, 5H, 4H, 3H, 2H, H, HB, B, 2B, 3B, 4B, 5B, 6B, 7B, 8B, 9B. I absolutly love your website, i have never painted ever before and am well only 15 so i am new to all these techniques and am frankly a little overwelmed. Also i live in Germany so i cant buy the exact paint you use plus i have a small budget. But i have time of so i decided why not try it. But i am having serious problems with my paint drying on the canvas before i can blend it into m other colors. For example on my first try i did the clouds and then the sky and i wanted them to blend more but my clouds were already completely dry… Any tips? And i finished the painting and it looks well in my eyes horrible i’m a true perfectionist in everything and its shining through as well when i paint… should i buy another canvas or just paint over it with the yellow ocre? Thanks for charing your knowledge to all of us… Your site is much easier to understand than any school art class. Acrylics do tend to dry quickly, when I’m approaching a painting with Acrylics I often premix colour strings that I keep on a stay-wet palette before I start to paint. If you do premix your colours, blending on the canvas does become easier as everything is wet at the same time. Sometimes paintings have many layers before they achieve the perfect finish you are after, so have patience and no need to start from scratch, have another go by adding to your painting with fresh paint. I’ve just started painting my first acrylic landscape following your lesson. I’m an absolute beginner and my question may sound silly. As you mention in your other video you are preparing the colors on stay-wet pallet first, but later as I noticed on the landscape lesson video, you are keeping the prepared colors at the side of the canvas. Can you tell me what background is that (where you keep your current pallet)? Is it just a paper or something else? Nice to hear from you, there are no silly questions when starting painting! On the landscape video I paint onto a tear-off palette. These are waxy throw away sheets that you can mix your colours onto (I use an A3 size for most of my paintings) When I’m painting with acrylics I’ll often work with both palettes. The stay-wet palette to ‘store’ larger mixes of colours I’ll use for the painting and the tear-off palette to actually mix onto. This was the stay-wet palette keeps relatively clean and you can ‘tear-off’ one of the sheets from the disposable palette if everything gets in a mess! I notice on your video that you seem to be able to blend the paint easily on the canvas when you go back to it. Acrylics dry so fast. Just wondering if you are using open acrylics? The fast drying time is a big problem for me with painting with acrylics. Hi Elinor, on all the demonstrations I use standard heavy body acrylics, I just add a touch of water to the mix to improve flow but do tend to work quickly. Once you’ve premixed a couple of colours you can spend less time mixing, and more time on the canvas. Will I think I’ve messed up a sunset at beach landscape. Don’t know what to do. I’ve used various colours like orange, blue, black, blue for the sky and it all looks so rubbish. What can I do? Can I start afresh? Sounds like the painting should be put to the side as a tester and start the process again. Just try mixing the 3 main colours I use, matching to the reference photo, and then build the painting from there. Less is definitely more, as the more colours you mix, the more exasperating it can become when you’re first starting. Just take things one step at a time – remember, it is estimated Picasso produced between a total of 20,000 and 50,000 works in his lifetime, so the odd repaint is all part of the learning process. I saw you’re video on youtube the other day then I stumble upon this site so it’s nice to put the 2 together. There aren’t enough people that put out free tutorials/direction on painting for the absolute beginner. Thanks! I’m sure i’ll enjoy the website! Cheers Heather, pleased you stumbled upon the site and are enjoying the tutorials. Thank you Will for this wonderful website. You’re welcome Sophia, hope you’re finding the tutorials helpful. I just came across this site today. I love painting but I never had any formal lessons. I am learning a lot from watching the video. Thank you so much for sharing. Hi Marietta, really pleased you stumbled upon the site and are enjoying the tutorials. Great to hear you’re learning a lot from the lessons. teacher and helpful techniqut lanscape painting for me. Hi Krittaya, great to hear from you. Thanks for your kind comments, pleased to hear you’ve found the landscape techniques useful in your painting. Love your site. I painted this landscape alongside your video and everyone says it’s not bad. Thankyou I find your site very helpful. Hey Will, wanted to let you know how much I’m enjoying your website….I painted a lot in my younger years ….put the brush and paints away for many years while raising my daughter ……now finding I have more time thought I would get back at it. Your instructions and tips have helped me regain confidence….love love love it. Thank you! Hi Julie, lovely o hear from you and so pleased you’re enjoying the website and feeling inspired to get the brushes out again! Absolutely love your website, and how you teach. 1. Can i substitute permanent rose for permanent alizarin crimson? 2. The picture i’m following has larger mountains. Can you suggest another colour? I feel Burnt umber will be too dark for such large mountains. Can i mix another colour like a purple-brown, or something else? Tell me how please? Are you sure the burnt umber is too dark? I like to start with the dark of the umber to insure there is a good tonal range in the painting. I would be tempted to try the burnt umber on a small sketch study (30 minutes max for the total painting) and then if you still fell it’s too dark mix another base colour you feel would work better for the particular mountain scene you’re working from. Thanks for writing back Will. Also, can i substitute lemon yellow for cadmium yellow light? You can use the lemon yellow, it won’t have as much opacity as the cadmium yellow and the colour bias of the lemon yellow is more towards blue so it will give you a slightly different effect. Great to see your website. I am an intermediate artist and was exploring ways to teach beginners how to paint! your website was quite helpful. Would like it if you could suggest how to engage beginners in the first 5 classes! Hi Meghna, pleased you’ve been enjoying the lessons, just work through one of the tutorials with your class, as soon as students start to see better results than they expected they’ll be keen to learn more. Try the cherry tutorial, it gets some fab results for absolute beginners to painting. After completing your cherry tutorial the next on my list to tackle was your landscape. I discovered there’s a moment in each painting where after blocking in shapes I felt as if I only created a mess without a road map as to how to leave it behind. On my third attempt I had an epiphany in the form of discarding the synthetic brushes for hog Bristol brushes. Much nicer brushstroke. I also discovered how important paint consistency is as well as that piece of “kitchen roll” you often refer to. Lastly, I think I’m getting a better handle on the wet pallet. Trying to paint with acrylics from a glass pallet is nearly impossible. The wet pallet opens up many possibilities for paint application. I’m slowly working up to some of your more advanced courses. I have my sights set on the beginners seascape and still life courses. Hey Chuck, great to hear from you. The paintings are looking fab, I’ve added your painting to the Cherry success page, looks absolutely great. So please your discovering a new rhythm with the paintings and learning the power of kitchen roll to control paint consistency! The wet palette can make a big difference, you can also try the method I sometimes use called ‘double pallete system.’ This is where you have larger blobs base colours in your stay-wet palette and then another harder, disposable palette for mixing pigments onto. Lovely colours on the landscape painting, its got that real sense of light to it. What a great site so glad I found it. Thanks Christine, hope you’re enjoying the tutorials. i am a student and i am abslutely delighted with yur style. i wish to ask for more such tutorials and i belive that these paintings can improve me, please suggest some more thanx. Hi Jenna, pleased you’ve been enjoying the lessons, have a look at the free acrylic tutorials to watch some more lessons. Will, I am so glad I stumbled upon your site!! You are a joy to watch and a wealth of priceless information. I’ve been painting a long time and it’s refreshing to be learning some new tricks. Thanks and keep up the great work! Thanks Debi, really pleased you’ve been enjoying the lessons and tutorials and picking up some new techniques. I want to start whit this but I have a little problem. I have only the transparent vermilion and the cadminyum red hue and prymary magenta on hend. which one of them can I use as an alternatif to Alizerin crismon? Or shel I go to the city and buy one? I wait a your answer ASAP. Hi Nilgun, if you mix in about a 1/4 of the primary magenta with 3/4 of cadmium red hue you’ll be able to achieve a colour very close to the one I use in the demo. I found a picture in a Bob Ross book I want to paint and it says to use black Gesso for the background. It’s a night picture with snow and birch trees. It uses oil and I use acrylic. Can I use thinned black paint? Hi, first of all, you..are..amazing !!! Thank you for all of these great tips ! There’s no art class in my region, so being able to follow you give me the chance to get a good start. Second, you’re able to give us the info in a simple way, which is great, because since starting painting is already intimidating, not having to do it with the pressure of a class working at a certain speed make ito much easier. Thank you and Hello from Canada friend! Hi Gabriel, thanks for your kind comments, great to hear you’re find the tutorials simple and easy to follow. Hi will. 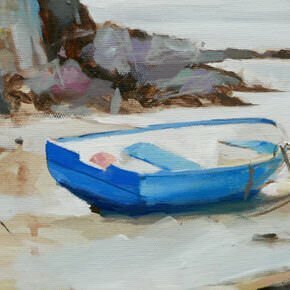 Your paintings tutorials are excellent and a great encouragement for beginners. I tried the acrylic landscape and it looked brilliant. Thankyou !!! Good one Zunera, so pleased you achieved some good results with the landscape painting. Hi Will! I find this tutorial very informative and good for beginners like me to practice blending and color mixing. Just had a little problem getting the light blue color.. I bought an ultramarine blue Grumbacher Academy paint and when I mixed it with titanium white, it turned into light blue violet. Is there a difference on ultramarine blue color depending on the brand? Hi Kay, colours can vary between brand, even if they are called the same colour, but for this painting a light blue violet would work perfectly. I am excited to have come across your website! Thank you for sharing your knowledge. I am about to try the yellow ochre. In the past I have used black gesso for preparing my canvas. Any comments on black gesso? Hi Faye, you’re welcome, hope you’re finding it helpful. Black gesso can be great, i sometimes use it for my abstract paintings. Thanks so much for your videos – they’re so good. This is my first time with acrylics, and I think it’s the first time I’ve tried painting since I was at school back in the 90s, so I’ve got lots to learn! Great work Jenny, really pleased you enjoyed it, you could just go a little thicker with some of the purples in the clouds and it will have that nice mix between transparent/opaque paint. So generous of you to share this tutorial. I had just finished my first acrylic seascape. Found it quite challenging and gave myself only 5/10 for the result! Wish I’ d seen your tutorial first! It explains and demonstrates everything so well. Thank you. Can’ t wait to start on another attempt. You’re welcome Jackie, really hope it helps with your next seascape painting. Hi Gowtham, pleased you found the lessons helpful, you’ve mixed a great selections of greens and the muted purple in the background works really well to add depth to your painting. I’m trying to paint a silhouette on canvas with acrylic paints, in which case the foreground is black and background is bright. Would you still suggest to paint the darkest shades first? or would it be better to paint the background first(given its bright) and then sketch the foreground on it? Hi Lepeka, either way would work well, depending on the subject I would personally start with the darkest first and then paint the lightest. I’m very glad I found you and your fabulous website. Your help and tips are very much appreciated and your work is spectacular. Do you find the soft body acrylics easier to use than the heavy body acrylics for landscapes ? Hi Susan, pleased you’ve been enjoying the website, it depends on how you personally like to paint, if you want to have thicker impasto marks the heavy body is best, if you find you are always painting thinly then a more fluid thinner paint would suit. Thank you for your advice. I’ll use the soft body paints in that case as I do a lot of glazing. It truly is a joy to listen to your videos. You speak so well and your voice is very easy on the ear. Thank you for sharing your knowledge and skill. Believe me you are much appreciated. You’re welcome Susan, thanks for your kind words. I really enjoy your tutorials. I have primed my canvas with a coat of acrylic,yellow ochre,and drew on to this a fairly detailed streetscape,in 4B pencil.It has some shading and is smudging on to my fingers. I wish to paint acrylic(watercolour technique) on to the drawing but I am worried about lose of bond between the acrylic and the canvas. Do you advise a fixative spray or a light acrylic wash to stabilise the graphite? If you want to have a more permanent fixing for the pencil then yes applying a layer of pencil fixative spray will work well, usually anything above a 2B can start to smudge depending on the absorbency of the ground. If you’re drawing very detailed work then a ‘Golden Pastel Ground’ can be handy to give you a real tooth for the pencil. These directions of yours really nice. But I would like to ask if the paint dries out can it still be changed back into liquid. Hi Aymen, if you’re using standard acrylics you won’t be able to change the consistency back to liquid, they will dry solid so you can overpaint and it won’t disturb the layer underneath. Thank you sir for your assistance. Love your site… came across it quite by accident. You have been a great help as very new to this. Thanks Jan, pleased you’re finding it helpful. I did this tutorial a couple years ago; I have my finished piece hanging in my hallway. I always look at it and think “heck, that didn’t turn out too bad”. Well I got away from painting for a time but the creative desire reemerged so I’m back at it now. I’m on to the cherry still life now and wondering why I quit. Thanks for the lessons and insight. Good one Robb, nice to hear from you and pleased you’re enjoying having a go at the cherry and getting creative with your painting. Here’s to a creative year! First of all, thanks very much for all your videos, for newbie like me, your demo instructions and tips are so valuable! From your tutorials I’ve seen, I have a couple of questions. 2. Is there a particular reason you color in the darkest, then the lightest then some other colors? What are the rule of thumb for the order when you fill in the colors? Many thanks for your time, and I so appreciate your videos!!! Hi Stephanie, pleased you’ve been enjoying the lessons. 1. How do you decide the color of the color ground? It’s a balance between the mood you’re after, the colour you want to highlight, or the feel of the painting. For the cherry the green/grey umber acted as a subtle complementary colour to the red so the red would really pop. For the apple I wanted to bright out the intensity of the yellow of the apple so went for a vivid yellow. It’s best to experiment with different coloured grounds to see which colours you find yourself drawn to. 2. Is there a particular reason you color in the darkest, then the lightest then some other colors? Yes, once you have the lightest and darkest tones (and the mid tone of the coloured ground) it’s easier to judge the relative tonal values of the subject you’re trying to paint. I am a big fan and have purchased a few of your courses in the past. After a few month hiatus, I have picked up my brush again and am ready to renew my latest hobby. I completed this landscape tutorial before but re-doing it will get me back in the swing. Problem is I can’t find the instructions for mixing the colors you start with in part 2. Can you point the way?? Hi Pat, pleased you’ve been enjoying the landscape course, I’ve just added the instructions for mixing the colours onto part 2 of the lesson. I’m so excited to have found your site! 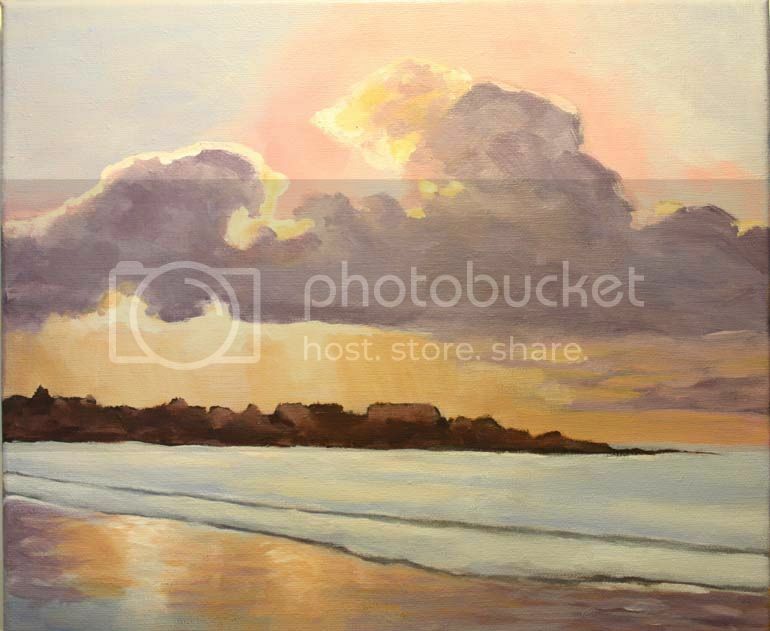 I’m a beginning painter and I’ve looked through your incredible website. I must admit, it’s hard to know what to do first. I purchased your drawing and your seascape lessons. But now I’ve found all these tutorials for free! I’m in heaven! Can’t wait to get started. I think I’ll do that beautiful landscape of the sea in the morning (or PM) not sure. Thank you. Your teaching style is perfect for those of us who know nothing at all. Hi Sue, so pleased you’ve been enjoying exploring the site, and hope you get some fab results on the drawing course. Good luck with your seascape. I recently painted a scene of ocean waves crashing on rocks, Pretty tough for a rank beginner, but I eventually got through it. Followed you-tube video. One difficulty that I had is that I was unable to find one of the requisite colours which was quite important to the painting. It was Australian Sienna, and not available in Canada, since it is a Matisse tube which is not sold here (as far as I can determine). Could not find a good substitute, so tried to mix various colours to replicate it, but was never satisfied. Would anyone have any suggestions about what one could-or should-do in such circumstances, to try to approximate the desired colour as best as possible? Depending on the brands available to you can use these as a starting point, for example, Golden paints have a Diarylide yellow a Transparent red oxide and a Yellow oxide. Alternatively, a Burnt sienna with a touch of brighter orange (cadmium orange or pyrrole orange) and touch of yellow ochre will get you very close. So glad to have found you. Like the lady who posted some time earlier I’m also a nurse, now that I have a bit more free time I’m going to teach myself how to paint proper, innit. I studied design history years ago, it’s always been my regret that I didn’t do a fine art degree (after a MAHOOSIVE falling out with my A level art teacher). I’d love to do it now but unfortunately funds won’t run to it, so I do community courses when I can. Funds are a bit tight, so am starting with System 3 and when I’m a bit more confident will invest in a Golden basic palette. I am lucky enough to have a spare room for studio space which is already stuffed with years worth of daubs, scribbles and prints, looking forward to developing my skills with your lovely site. 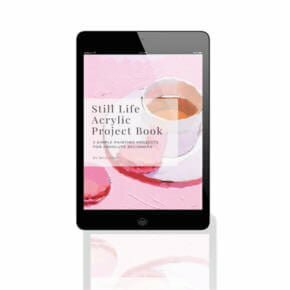 Great one Allie, really hope you find the lessons helpful, if you can add a Golden Titanium white to your System 3 paints it can really help for added opacity to your mixes. I so enjoyed and had fun with your painting lesson. It was just what I was looking for a step by step lesson for a very beginner . It was very helpful. I struggled a little with matching the colors but I’m learning. I wanted to send a picture of my picture so you could give me any tips to help me out. I’m not sure how to send it? Really pleased to hear it Patty, you can drop me an email on the contact page, would love to see how the painting turned out. Thought I’d ask a question here. Getting together the colours and looking through what I have – The only one I do not have is cadmium yellow light, but I do have lemon yellow (in Daler-Rowney system 3) and permanent yellow (in Rowny Cryla (which I think is artist grade?)). Can I use either of these instead of cadmium yellow light? Or does it have to be a cadmium? The rest of my colours are student grade – Daler Rowney System 3 or winsor and Newton Galeria, except titanium white which I do have in Rowny Cryla. Will this mixing of brands and grades be okay? Hi Ash, I’d go for the permanent yellow in the artist grade, mixing the brands and grade will be fine, there will be subtle differences in opacity, the flow of the paint, coverage and drying time, but they will all still all work together. Hi Lori, really pleased you’ve been enjoying the site, the National Gallery & The National Portrait Gallery (next door) have great permanent collections for more classical paintings. Tate Modern is brilliant for contemporary art and you can get a river boat to see the largest collection of Turner paintings at Tate Britain. There is also a good temporary show on at the moment at the British Museum: American Dream for American pop art. Just found your site and, Wow!, what a comprehensive site it is. Very well done Indeed, congratulations. 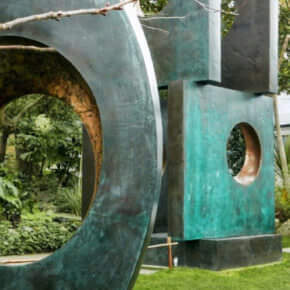 My question is, looking at the landscape video it would appear that you mix all the colours you need (the main ones at least) and then the paint the whole picture in one go so as to blend the colours into each other as necessary. As acrylic paint dries so quickly isn’t there a danger of the pigment drying on the pallet before you can get to it? I know that mixing will be a slow process for me. Would a spray of water help, or possibly using the slow-dry media? I am a slow, learner painter in watercolour, and am sure to be the same with my acrylics, which I have never used before. Nice to hear from you, and pleased you’ve been enjoying the website and tutorials. For larger scale paintings you can use a stay-wet palette to keep your paint mixtures wetter for a lot longer. Yes, you can also mist the paints you’re working with. Acrylic dry by evaporation, so adding more moisture to the paints helps to keep them more workable. I have an emergency! Against my better judgement, I accepted a short notice commission. I am struggling with mid-tone color mixing large quantities, as well as adjusting my normal canvas size to a much larger canvas!! I do not know what I am doing wrong. Subject is a Seascape. I used yellow ochre for my colored ground, using, alizarin crimson, burnt umber, ultramarine blue, cad yellow, titanium white. The main probs I’m having is covering the whole canvas with such a quick drying time. I am using a glazing medium. And spritzing with water as well. Still too fast. The other problem is having to adjust all my mid-tone once applied. I blocked in a few rocks with burnt umber, and a few highlighted areas with white hoping my mixing would be accurate once i had darks and lights in. So frustrated! Any ideas??? Hi Rachel, if you mist the canvas with a water mister that will give you a longer working time for the initial application, you could also try adding a little slow drying medium into your paints to give you a longer op time. Good luck with the commission! When you mix these colors ahead of time. How do you keep them viable when it comes time to use them…or maybe I’m just really slow. Hi Doug, I use a stay-wet palette to keep them wet, you might find this introduction guide of interest. Hi Steve, so pleased you’ve been finding the lessons have been helping in overcoming your painting overwhelm! Hope the first paintings are coming together well. Thank you so much for this!! This will be my first attempt at painting, ever! I’ve gotten as far as painting the background so far. I do have a background in photography and my goal is to paint some of my photos. I’ve gotten a bit bored with photography and photoshop so it’s time to give the brush a try. Your way of teaching is brilliant!! I just wanted to let you know how much I have appreciated your help so far. 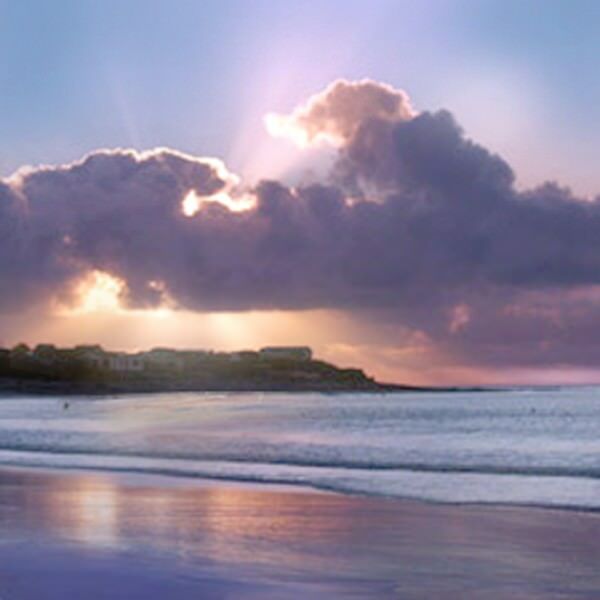 Hi Janice, great to hear from you and so pleased you’ve feeling inspired from the lessons. Really hope the painting goes well, with your photographer’s eye I think you’ll achieve some fab results.